The next day I woke up with snow in my hair. I had shivered all night and hardly slept at all, but for some reason, felt well rested. As we walked out into the morning, everybody had started waking up. And almost everybody had complaints. Ramesh, Kartik and I had painfully numb toes. Anuj had slept in an awkward position. Sarita too had snow in her hair and she refused to leave the tent until it became warmer outside. Manisha had been on the verge of tears thanks to the cold and the wind. Ruchi, like me, had shivered a lot. Vishnu’s chest pain was no better. And everybody had felt really, really cold. Over breakfast (steaming hot Chhola Poori), we had a critical decision to make. Manisha and Mansi had a bad bout of cough and cold. Sarita was miserable. And Ruchi was worried about Vishnu. They had the option of turning back and going to Leh by road. Gyanji had made it clear that from here on, we could only go ahead. If anybody wanted to come back, the entire group will have to come back with them. The guide didn’t want to split his food and kerosene supplies and his team of cooks during the trip. Sarita and Jay decided to go back and spend the week in Leh. Vishnu also followed suit. Manisha, however, broke into tears at the prospect of going back without completing the trip. So Bisu and Mansi too decided to stay and attempt the trek. 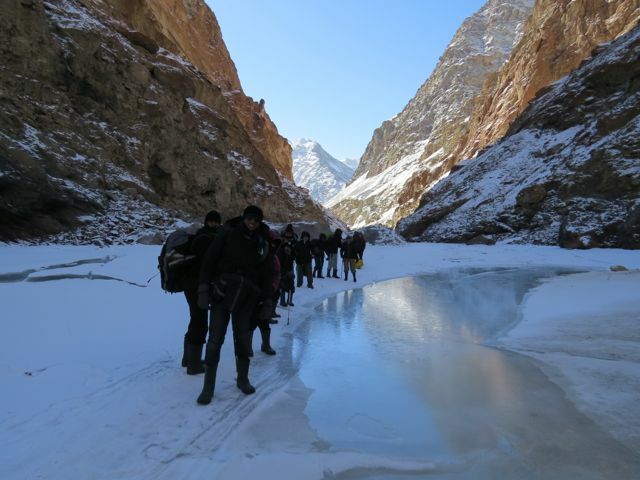 At 10:30, Jay, Sarita and Vishnu started for Leh, leaving behind a group of thirteen. At 11, this group started the forward journey ahead. It was a bright and sunny morning. There wasn’t much wind. And in front of us, lay the Chadar. It is difficult to make someone imagine the valley if they haven’t seen it. It’s a vast expanse of ice and snow as far you can see. Most of the mountains are covered with snow, but there are a fair number of those which are not. Some of them have a sandy brown soil, some have a chocolate brown rocky exterior. But the ground is all snow. 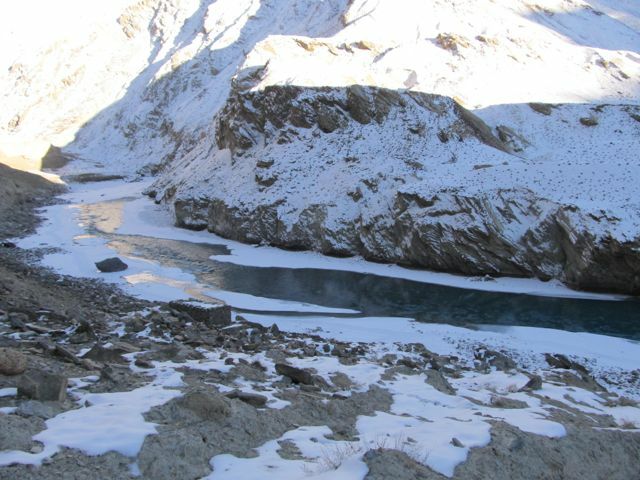 Cutting through the snow, flows the river Zanskar, sometimes a pure blue, sometimes a murky green. It is very difficult to remember that the snow you are walking on is water, and the water is mainly the river. 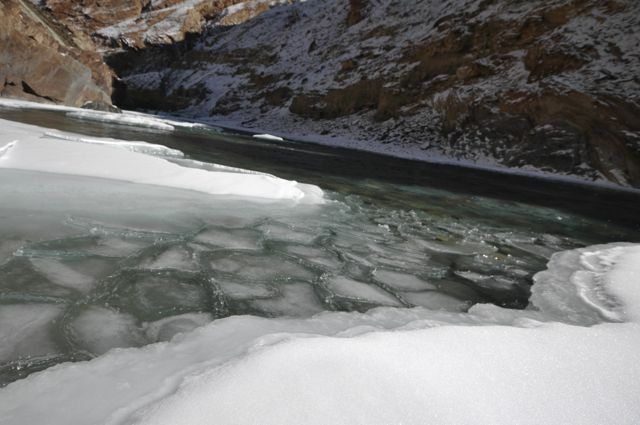 Its all one and the same – the river, the ice, and the snow covering it. On the other hand, it is surprisingly easy to forget yourself in the silence – a silence which comes from the absence of all plant, animal and bird life in the valley. Through this silence, we walked. Most of us were silent too, as walking was consuming almost all of our breath. In our feet, we had the gum boots that Gyanji had given us in the morning. They were very good on the snowy terrain, and were also completely water proof. But the best thing about them was that, as we walked, we could feel the warmth returning to our feet. For a few reasons, I like to walk ahead of the group, and Kartik joined me in the walk. Bhavdeep accompanied us, and sometimes Gayatri and Ramesh joined. Anuj and Ruchi started competing with Kartik and me for the first position, and we had a fun time. However, behind us, Mansi was facing a severe breathing problem, and Utkarsh, Prarabdh and Dileep along with Manisha and Bisu walked with them. At regular intervals, we stopped for them to catch up with us, and then resumed again at our normal speed. The walk on snow was mostly easy. We were simply following the trails left by the porters who had gone ahead of us. But at one point, most of the snow had molten away, and what remained was a narrow strip of slippery ice clinging to the mountain. Here, we had to remove our bag packs and give them to the porters, and then sit down, bend over and slide over the ice to the other side, where there was enough snow. After all of this, when we reached our lunch site at the Lower Shingra, we were running late. It was 2:30 in the afternoon, and to be safe, we had to reach our campsite, Upper Shingra, by 4. In addition, Mansi’s condition was terrible, to say the least. After much deliberation, we came to a decision. We would camp at Lower Shingra, and if Mansi and Manisha don’t feel any better the next day morning, they will leave with Bisu for Tilat. 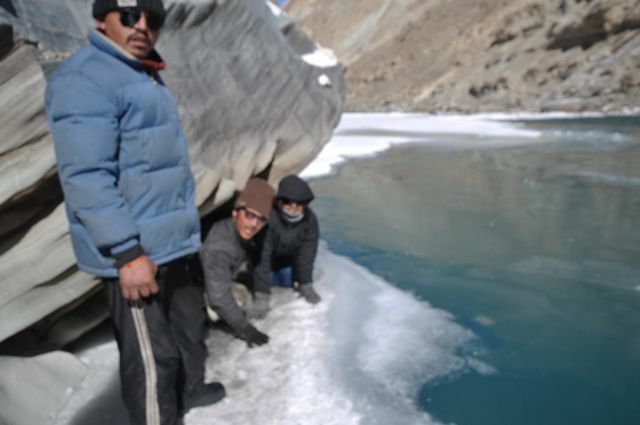 As only half a day’s distance was covered, they wouldn’t need to camp again at Tilat – they could catch a bus straight to Leh. That way, the cooks and the stores will remain with the team going ahead. Thus, at 3:15 PM, our lunch site , Shingra Yokma, i.e. Lower Shingra, became our campsite. As the team started pitching in the tents, we all set out for a walk in the area, in the hopes of catching the last few rays of the setting sun. Shingra Yokma was a beautiful campsite. 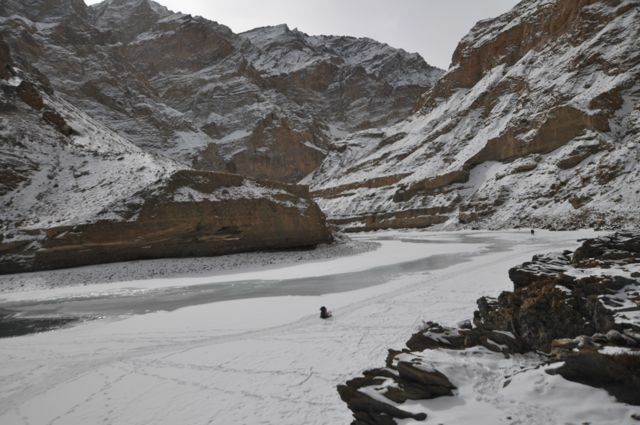 The river flowed really close to the grounds, and the porters had to shovel the snow off the land for the sake of our tents. But it was also very open to the elements, offering the promise of a windy, cold night. It became colder the very moment the sun sank. Within an hour, my feet were cold again, despite the fact that I was wriggling my toes all the time. But this time, we had ample of wood, and they made a good fire. As Utkarsh and Bhavdeep started barricading the girls’ tent against the winds, we sat around the fire, munching pop corn with tomato soup. Our camp at Shingra Yokma – The brown tent on the left belongs to the cooks and helpers. The big green tents was for the girls, and the little blue and green tents were the guys’ refuge. Another group had camped at Lower Shingra that evening. They were a smaller group on their way back from Lingshed. Ramesh, Bhavdeep and a few Flipkartians joined them for a chat around their fire. They told us later, over dinner, that the group had waded through water just before reaching the camp. The Chadar was melting earlier than usual, and they had encountered water at quite a few places. Luckily they had a lot of spare woolen socks, because without those, they said, the trek ahead would be impossible. 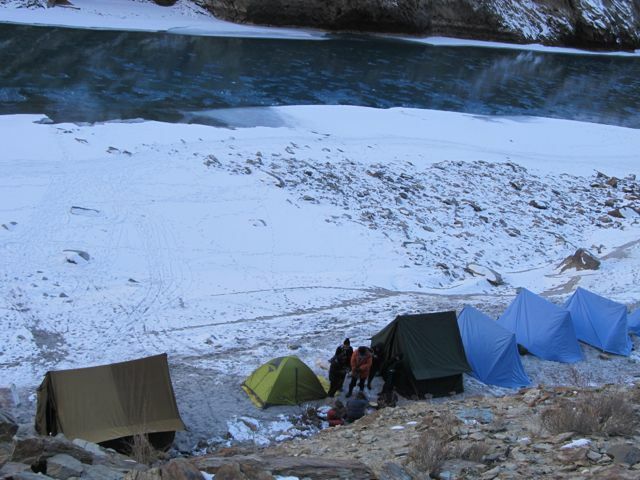 We couldn’t help noticing that they had good quality winter tents unlike the flimsy summer tents we were provided with. They even had small room heaters in their tents. And I couldn’t help but count the number of socks I had – 2 woolen and 3 regular. All evening, Gyanji tried to burn the huge stem of a tree they had uprooted. Kartik took his place when the guide wasn’t around – he had become quite good at handling the fire. While they both poked the coals, we tried to warm ourselves as best as we could. When we faced the fire, the wind would come from behind us, freezing the backside. When we would turn around, the winds would bite our faces before the warmth would spread through our backs. Finally, giving it up as a futile exercise, we all moved into our tent again. Mansi and Bisu stayed together, while Manisha joined the girls’ tent. It was warm inside, and they had closed the tent to the winds in as many ways as possible. But as the night progressed, the inevitable cold returned. My toes froze and the very air we were breathing became chilly. The 3 spoonfuls of brandy I had sipped became inconsequential. That night, I understood the true power of cold. It can make your teeth clatter, it can make your fingers and toes go numb, it can make your whole body shiver. Yes, but that’s not the worst of it. The true power of cold lies in the way it saps your morale out of you. It dampens your spirit to its lowest, it makes you doubt yourself. And that night, I, we all, faced the cold at it’s worst. All night, the winds lashed against our tents. The temperature must have been -20, but with the winds, it reached our skins at a -30. Kartik also started coughing, and with that, I became doubtful about everything. I had seen the Chadar and walked over it. By the next morning, I would have survived two chilly nights in the valley. Did I have anything to prove? Couldn’t I just leave tomorrow, along with Kartik, for a warm bed in Leh? A voice in my heart told me – ‘But it was a challenge…’. That feeling, when you would have finished the trek, would be a feeling of victory, said the voice. That small part of me wanted the victory, but as the night progressed, as I heard Kartik coughing, that part became smaller and smaller, and that voice became weaker and weaker. That night, nobody sang. Sometime during the night, Anuj howled. But caught in the turmoil of my own thoughts, I never heard it. Ut, Bhavdeep, Ramesh, Pra and Anuj saw a shooting star in the sky, and I never came to know of that. That night, lost in the gloom brought upon us by cold and sickness, I decided to cut my trek short and turn back to Leh the next morning. 3 Responses to "The Chadar Trek Journal – Day 2 – Tilat to Lower Shingra"